I make seven can soup as soon as the weather turns cool.3 cans Minestrone soup, two cans of Rotell tomatoes(I use mild), two cans Bushes pinto beans, 1&1/2 lbs already browned ground beef. Put all ingredients in crock pot and cook all day. I make a pan of cornbread to go with it. This tastes good the second day singes the spice ness soaks in. 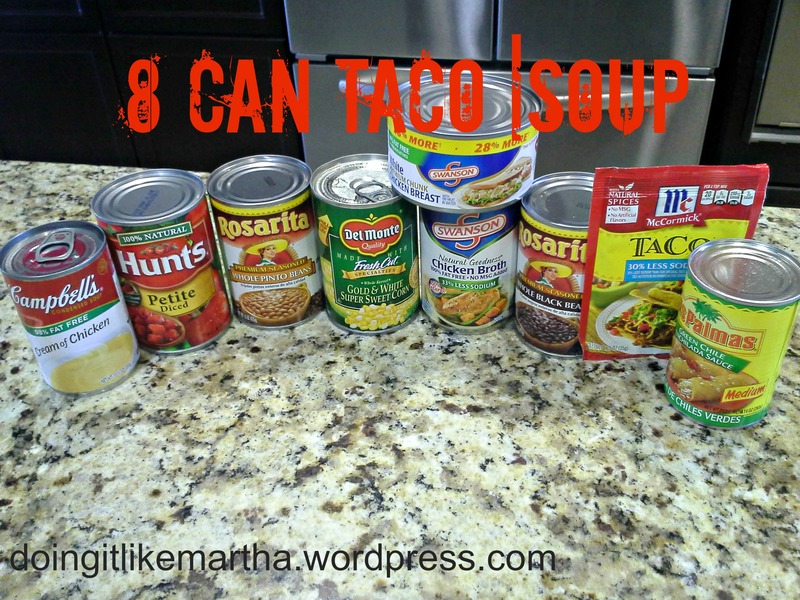 Anyone know how many servings would be in that 7 can taco soup? Do you drain the beans or anything? Or just dump it in all together, liquid and all, into the crock pot? I love this idea!!! I am adding this to my food basket list for friends who are home ill and family needs a supper that will go together easily as well as for a friend who needs a quick, tasty dinner after a long day at work… The possibilities are endless!!! Thanks for sharing!!! This has nothing to do with the recipe but I’ve never seen anyone else with the same spelling of my name lol. I didn’t think to check that out! Next time I make it I will definitely calculate the carbs. Luckily you can tweak the recipe to your dietary specifications, like using low sodium chicken broth, beans, or even fresh chicken to avoid added salt etc. This soup is wonderful…..My daughter, Sarah, makes this all the time……. Sounds delicious and easy. Thanks! I will surely try this Taco soup, it looks delicious! I went and bought all the things for this yesterday and the weather was warm, woke up today and it’s freezing! Good thing I I was planning to make this today! Thank you for putting this! I’m super excited about trying it! A large brick of velveta cheese melted in taco soup, makes it !!! Possible to use browned hamburger instead of chicken? My version is a can of pinto beans, can of chili beans, can of creamed corn, can of white hominy, can of Rotel, 1 and 1/2 lbs. of browned ground beef, and a packet of dry ranch dressing. You don’t have to drain the beans or anything! 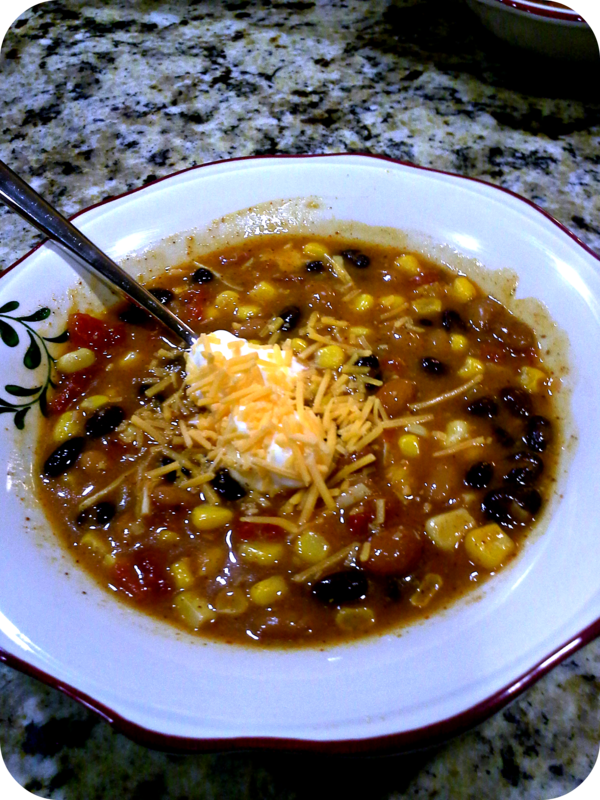 We call it taco soup because the chili beans and Rotel give it that spicy flavor. You can cook it on top of the stove or in a crock pot. 2 hours on high or 4 hours on slow. You can have a bowl by itself, or with corn chips, shredded cheese, and sour cream. It makes a slow cooker full, at least 10 cups. But it also freezes well. I would think that would be good too! I make this all the time, it’s great! Thanks…living in tropics but will still make this! I used left over grilled chicken…added a little smoky undertone. My family LOVED it! I will have to try that, that sounds great! Made this last night and it is delicious! I work as an event planner for a grocery store chain and we made this as a demo. It was wonderful and super easy. I also made it at home for my family. Works well in the crockpot. I use 4 # of ground beef instead of chicken. Brown your ground beef with 3 pkgs of taco seasoning. Drain. Add meat to 1 or 2 cans of tomato juice, depending on how “soupy” you want yours.Then add 3 cans of black beans, ( rinsed) 3 cans of whole kernel corn, 3 cans of diced tomatoes, 3 cans of hot chili beans, ( you can substitute kidney or pinto beans for the hot chili beans ) Throw it into a crock pot and forget about it for about 4 hrs or, you can heat it up on the stove until it starts to boil and it’s ready! 🙂 Pour into bowls,over tortilla chips, Garnish with shredded cheese and sour cream. Trying this on Friday at work. Everyone is bringing in a can to add to the soup. Yum! That’s sounds SO Very very AWESOME!!! I made this the night before so it could “sit” together. Excellent soup. So easy when you don’t want to cook. I used the rotisserie chicken too. My grown kids think mom has a secret ingredient for this and I do it’s that is so easy and sooooooo good they all love it they want it for dinner on Sundays. Thanks for helping a great grandmother of 3 boys and grand mom to 9. Thank-you for sharing this recipe. I use it all of the time! It is easy and delicious. I have always made a version of this called Southwest Stew and it is yummy as well, but this is much easier and just as good!! I have it saved on my favorites list! Thanks again!! ⚞This is the MOST AMAZING IDEA💥 THAT y’all came up with.. This Taco Soup recipe is the best. I got it from my youngest daughter that does not cook, so it is so easy to make. When my oldest daughter makes the recipe, she doubles the recipe. I have given families in need the recipe and provide all the ingredients to make the soup. Can’t say enough good things about it.